I'm rarely impressed by an artist, but I was blown away when I heard Elisa Peimer. I would not be surprised to see Elisa on a major label soon! 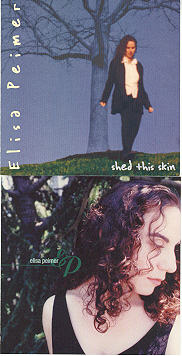 If you want to hear some great music, I suggest you go out and buy Elisa's 4 song CD, which is self-entitled Elisa Peimer and her full length CD entitled "Shed The Skin". This is some of the best music I've heard this year. Elisa Peimer's style could be compared to artists, such as Jewel or Sarah McGaughlen in genre, however her songs are stronger lyrically, vocally and musically. I found on Elisa's first 3 song CD "Leaving Here Tomorrow" to be a highly moving ballad, which I was compelled to listen to time and time again. It came as no surprise that Elisa's had a great deal of success with that song in film and television. I recently listened to Elisa's new CD entitled "Shed The Skin". This CD was full of cleverly written songs that were highly commercial and relateable. I felt Elisa took me through a roller coaster ride of emotions with her highly visual lyrics that we can all relate to, but are written in her own unique way. Her voice is strong and beautiful at the same time. I loved all the songs on the 13 track CD "Shed The Skin" and could see any of them becoming radio hits. My favorite track is track 11 "Damage", this song is very cleverly written and most people can relate to going out with someone who is "damaged". It is a rock song with moody tempo changes. It's an all around wonderful song. I also loved track track 4 "Cellar Door" a song with a driving force and written in a unique poetic way with wonderful tempo changes, track 3 "Close" and 13 "Cracked" are beautifully sung ballads, and track 7 "Driving In The Rain" is another favorite of mine, but they were all wonderful songs with top hit potential.